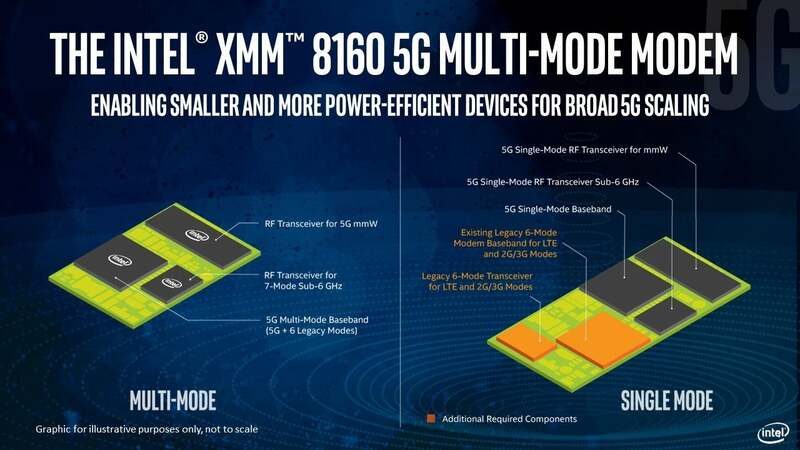 Intel has just announced that it moved up the launch of its 5G modem, the XMM 8160, by an impressive six months. This multi-mode modem—it supports 2G, 3G, 4G, and 5G—is capable of speeds up to six gigabits per second and supports most of the exciting new technologies expected in the first wave of 5G mobile products. That means millimeter wave support, stand-alone and non-stand-alone modes, and simultaneous connections to 4G and 5G networks. 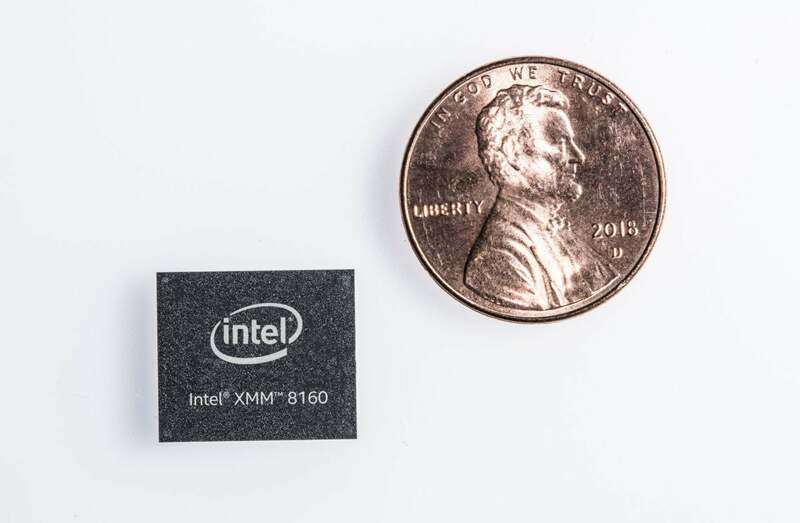 Intel’s XM 8160 modem will connect to 2G, 3G, 4G, and 5G networks. That means fewer chips, and it’s essentially a requirement for products like the iPhone. This is the modem that most technology analysts expect to appear in the first 5G iPhone. Apple switched to using Intel’s modems exclusively with this year’s iPhones—the iPhone XS and XR both use the Intel XMM 7560 modem—and the company is generally expected to stick with Intel in 2019 and 2020. And now, Intel’s 5G modem is going to be available earlier. There are a number of breathless reports circulating around about how this acceleration of the rollout means that we might see a 5G capable iPhone in 2019. That’s highly unlikely. This particular acceleration of 5G availability will impact some other phones, but probably not Apple’s. When I Can Get It: The Intel XMM 8160 5G modem is expected to ship in the second half of 2019. Commercial devices using the Intel XMM 8160 5G modem including phones, PCs and broadband access gateways are expected to be available in the first half of 2020. If manufacturers (like Apple) are only going to get the modem in the second half 2019 (after Intel’s accelerated rollout), it’s definitely not going to ship in an iPhone in September of that same year! Integration and testing of new modem hardware takes months, and when it comes to brand new-generation cellular technology (especially tech that's as tricky as 5G), that timetable just blows up. Throughout 2019, 5G is primarily going to appear in higher-power devices like fixed residential broadband or maybe some big, fat Android phones with huge batteries. The kind of low power use, tight integration, and reliability that's necessary for the iPhone (and most top-tier Android phones) will simply not be ready in 2019. At least, not with Intel’s XMM 8160 modem. The XMM 8160 is small, but it has to be paired with two radio transceivers: one for sub-6GHz bands, one for millimeter wave. Moving up availability by half a year sounds exciting, but since iPhones are released in the September/October timeframe, it doesn’t really have much of an impact on them. Intel’s old timetable reported commercial availability in the first half of 2020, with products on shelves in the second half of 2020. That's just in time for the 2020 iPhone rollout, if we make the reasonable assumption that Apple is doing a lot of work ahead of time with Intel and other partners on testing 5G technology. Moving up six months doesn’t change anything, unless Apple suddenly shifts its entire hardware rollout schedule and pushes out a new iPhone in the spring of 2020. Intel would have to accelerate the XMM 7560 launch by a full year in order to get it inside the 2019 iPhone. So take a breath, iPhone fans. I know the prospect of a 5G iPhone is enticing, but it’s almost certainly still not coming until autumn 2020. Apple is almost never the first to adopt bleeding-edge cellular technology, and as we get set to flip the calendars over to 2019, mobile 5G is still very much in the testing phase.